The third time’s not quite as charming for Shrek and his merry band of fairy tale things, but there are still enough inspired bits to make Shrek the Third worthwhile. All’s not well in Far Far Away. Shrek (Mike Myers, Wayne’s World) has been filling in as king of the land and he and Fiona (Cameron Diaz, The Holiday) have struggled mightily with things like fancy clothes, social gatherings, and civic events. In moments of pomp and circumstance, Shrek burns down a ship during a christening and beheads a soldier during a knighting ceremony. With King Harold, the frog king (John Cleese, Charlotte’s Web), at death’s door, the future of Far Far Away falls on Shrek’s husky shoulders. But all he wants is to go back to his bog and wallow in the mud. Thankfully, the king clues Shrek into one other possibility for the throne: there is another family member and his name is Arthur (Justin Timberlake, Black Snake Moan). Faster than you can say “ogre eater,” Shrek, Donkey (Eddie Murphy, Bowfinger), and Puss in Boots (Antonio Banderas, Spy Kids) take off on a quest to bring Arthur back to his proper place on the throne. Alas, Prince Charming (Rupert Everett, Inspector Gadget), relegated to starring in shoddy dinner theatre productions, wants his revenge and rallies a throng of evil characters, including Captain Hook and Cyclops, to help him bring down Far Far Away while Shrek and company are out of town. As it turns out, Arthur is a teenager at the bottom of the social totem pole; even the nerds pick on him. And that hook, the story of a kid shunned by others, but who really has a great future ahead of him, provides another opportunity to explore themes found in the past two movies. It’s all about accepting you for you. Shrek is comfortable in his own green skin and he knows he’s not king material. Arthur, on the hand, is an awkward teenager with a chip on his should and he still needs to learn his own self worth. As far as themes in animated movies go, that’s a good one. And it still holds up fairly well. Still, Shrek the Third is not quite at the same level as the first two movies. The first Shrek was a treat; a gorgeously-produced spoof of fairly tales with a modern sensibility. Shrek 2 benefited from the surprise success of its predecessor and upped the ante with the introduction of Puss in Boots, Larry King supplying the voice of Doris, and a really cool magic potion factory. Alas, this time around there are no real surprises. All the same characters are back for more — and that’s what a good portion of the movie feels like: simply more. That “more” extends to the ol” TV sit-com routine where, after the series runs its course, the TV family endeared by millions adds another baby to the family in desperate hopes of reinvigorating the show. Of course, a lot of real-life marriages follow the same strategy to no avail. Here Shrek and Fiona find themselves in the family way, but all it gets them is one funny Rosemary’s Baby reference and not much more. Fortunately, Shrek the Third still manages some truly inspired bits along the way. Most notable is a very funny sequence in which poor li’l Gingerbread Man is once again imperiled and his entire, short life flashes in front of his eyes. And then there’s Merlin. What would an Arthur story be without Merlin? Well, Merlin’s had to get out of the sorcery business after suffering from “Level Three Fatigue;” now he’s a Birkenstock-wearing granola (yes, Birks with socks) and he’s into all sorts of touchy-feely therapies. Throw in an “unhappy hour” at the local pub frequented by the baddies in all the fairy tales (hey now, bad guys have hopes and dreams, too, don’t ya know? ), Heart’s Barracuda, and a funny bit in which Donkey yells out the immortal line, “Look out — they’ve got a piano!” and the end result is an agreeably entertaining sequel. Agreeably entertaining, though, is still a step down compared to the prior two movies. 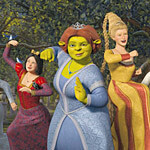 With Shrek 4 already announced and chatter floating around about a fifth installment plus a Puss in Boots spin-off, Shrek would perhaps be best served by Dreamworks taking a bit of a breather and regrouping later on before plunging in to the next Shrektified endeavor.